The Conquest of Happiness, which was commissioned by the Culture Company as part of the UK City of Culture 2013 celebrations, will be an avant garde, daring and unexpected show and will premiere on the evenings of 20 and 21 September in the open air at Ebrington Square in Derry~Londonderry. Directed by acclaimed Bosnian theatre director Haris Pašović in his UK and Ireland debut, the theatre and music show is inspired by the writing of world-renowned pacifist Bertrand Russell who penned the book of the same name in the final years of his life. The Conquest of Happiness became known as the world’s first self-help book and began with the insight that “the secret of happiness is to face the fact that the world is horrible, horrible, horrible”. The production will contextualize Russell’s writing against some of the most horrific acts of war of the twentieth and twenty first centuries. A dynamic combination of first hand accounts and dramatization of real life events in Palestine, Vietnam, Northern Ireland, Cambodia, Chile, America and Bosnia, the show will explore humanity’s capacity for horror but also for endurance, love and generosity in even the most desperate circumstances. 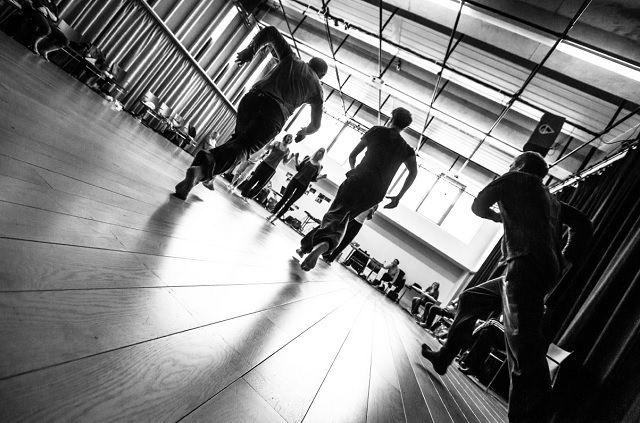 The production will be experiential and multi-disciplinary using dance, theatre and live music and featuring a people’s choir of adults and children. With an international cast of actors and dancers hail from Northern Ireland, the Republic of Ireland, Slovenia, Bosnia, Belgium and England, The Conquest of Happiness guarantees an awe-inspiring and breathtaking night of open-air theatre unlike anything ever seen in Northern Ireland. After it opens in Derry~Londonderry the show will embark on a tour to Bosnia, Croatia, Slovenia and Serbia before returning for closing performances in Belfast. The Conquest of Happiness is being performed in meaningful spaces including the site of the old Ebrington Barracks in Derry~Londonderry and under the famous Mostar Bridge which was bombed during the Bosnian war and rebuilt as a symbol of unity and beauty. The Conquest of Happiness is unique cultural collaboration between three theatre companies - Prime Cut Productions Northern Ireland, East West Centar Bosnia-Herzegovina and Mladinsko Theatre, Slovenia. Co-created with Prime Cut’s Artistic Director Emma Jordan, the production has grown and evolved since 2010. Executive Programmer with Culture Company 2013, Graeme Farrow, said the performance would push the boundaries of drama in terms of its visual approach. “This unique collaboration incorporates the work of 50 artists from seven countries who have drawn on their own first hand experiences of conflict to produce what promises to be an explosive dramatic work,” he explained. 20 & 21 September 2013, Ebrington Square, Derry~Londonderry as part of the UK 2013 City of Culture celebrations. Wet-weather, warm clothing essential. Tickets £12 and £8 concession. Contact the Box Office on 028 7126 4455. 25 & 26 October, T13 Titanic Quarter Belfast as part of the Ulster Bank Belfast Festival At Queens. Wet-weather, warm clothing essential. Tickets £15 and £10 concenssion. Contact the Box Office on 028 9097 1197 or visit www.belfastfestival.com.